A dog's bark echos around the quiet dark courtyard as I sit in the kitchen drinking some water. The building the hostel occupies part of is a slightly disheveled grand old Hungarian apartment building, located a couple of blocks from the parliament. The stairs have loops for carpet rods, and Alex, the congenial host of the Centrum hostel, apologetically joked that he hadn't had time to put the red carpet back in for our arrival. As Ste and I are the only guests at this quiet time of year we've been given the small apartment that adjoins the hostel. The apartment has been lovingly refurbished, with some of changes clearly more made of love than common sense. The light switches for the main room are now hidden behind a creaky pine staircase and the downstairs bedroom is divided by a double bed that reaches wall to wall. I look at the free tourist map that Alex scribbled on furiously last night, high-lighting all the sights we should see in our brief visit. There isn't a grid square free of the energetic biro circles and arrows that he used to mark out his recommendations. There's a lot of do in Budapest. We make a start by crossing the Chain Bridge over the Danube to Buda in the freezing wind. Hungarian and Czech flags snap and flutter along the edge of the bridge, which looks very similar to the Clifton suspension bridge in Bristol. After the short climb up the winding road we reach the terrace of Buda Castle, looking back over the low-rise of Pest, with the parliament and St Stephen's cathedral domes standing clear above the rest of the city. I snap away a few time with my camera, taking photos I know won't be terribly interesting to look at, but I want to have anyway. Ste is more reserved. He's only brought a film camera, so he takes the occasional photo, carefully composed and balanced. This is what I see as the difference between 'real' photography and just taking photos. Those pictures of a night out with friends, you at the Eiffel Tower or a family photo in the back garden; they mean something to you, but not to someone who isn't already emotionally involved with the people or place depicted. I suppose here I'm categorising 'real' photographs as ones which are self contained. They convey a meaning, a feeling or an interest of their own without the support of memory. The balancing of light and dark, the narrative in the picture or the high-lighted normally overlooked elements allow the photo to be complete on its own; no need to be linked to the people of place the photo is of. There has been a fortification on site of Buda Castle since the 13th century, in the 16th century it was sacked and then occupied by the Ottoman Turks to become part of the Ottoman empire until 1686 when it was almost completely destroyed in a great siege as allied Christian forces took control of Budapest. In the bright sunlight we notice occasional bullet holes and repairs of small slightly mis-coloured patches in much of the stonework; scars of the heavy destruction that the current palace suffered in the siege of Budapest in 1944-45, its most recent conflict. In the UK I think we rarely realise how fortunate we to be an island, with clear geographic boarders that have allowed us to stay (relatively) clear of conflict at home over the centuries. Hungary, like the Balkans south of it, has been swept repeatedly by tides of opposing powers and armies. Ste and I continue onto the bright white stone of the Fisherman's bastion and the colourful roof of the Mathias church, admiring both sites briefly before the cold persuades us seek warmth and food. We wander down the winding streets back towards the Danube and find a cafe to warm up in. At two thirty we try our luck with another free walking tour, after our excellent experience in Belgrade. We arrive at the prescribed bus stop to find a thin student standing by himself next to a single speed bike and holding a folded and tatty laminated piece of paper saying: 'Free Tours'. After waiting another five minutes no-one else turns up for the tour, leaving Ste and I as the only guests on today's round. The guide introduces himself as Adam and seems unfazed by only having a small audience, he unlocks his bike and wheels it alongside himself as we set off. Ste and I are shuffling along trying to keep warm in the icy wind; Adam is only wearing a thin jacket and no gloves. His only concession to the cold is a beanie hat that I suspect he's wearing more for reasons of fashion than to stay warm. Adam starts by explaining that the Hungarians are a friendly but boastful people, so we should be careful of sights advertised as 'biggest in central Europe', 'longest in Eastern Europe' or 'oldest in Western Europe' as depending on which superlative is being sought Hungary can position itself almost anywhere within Europe to make sure it looks its best. As we wander up Hercegprimas Street Adam explains the history of the various peoples that have lived in the area now known as Hungary. We stand for a moment and admire the grand neo-classical Roman Catholic basilica of St Stephen, named after Hungary's first king and erected to honour his converting the hungarians from paganism to Christianity. As we stand opposite the basilica a familiar voice calls "Hello!" and we turn to see the professor from yesterday's train journey rushing towards us with a smile on his face. "I was just in the cafe there with a friend and saw you through the window, so thought I should say hello." He shakes our hands warmly, introduces himself to Adam and then takes his leave to return to his friend who is waiting in the warmth of the cafe. In less than twenty-four hours Hungary has become a lot smaller and friendlier. We continue onto Freedom Square (Szabadság tér), the former site of an Austrian barrack that was demolished when Hungary become an equal partner in the Austro-Hungarian empire. As we look at the grand buildings of former banks and stock exchanges that flank the square Adam tells us of his memories under communist rule. Adam was only very young, but still remembers times when there wasn't bread or other simple foodstuffs available, and getting what was available involved queuing for hours. Somethings were almost impossible to get, and so very desirable; such as blue denim jeans. Apparently there was a huge black market, mostly supplied by visiting western travellers, in jeans. Those who owned them would often rent them onto friends for special occasions, like dates. For girls especially wearing jeans on a date was meant to show that you had good connections and so could help provide for a future family. Travel was very restricted, but Adam and his family were lucky to have relatives outside Hungary, which meant they could get travel visas. More importantly this meant they could buy luxury items in Austria with the limited money you were allowed to take with you on your travels. This way they would smuggle back things like coffee and pencils that couldn't be bought in Hungary. One common trick for families with small children was to get their children to fall asleep on a pile of coats which hid the valuable goods. The boarder guards wouldn't disturb the sleeping child as long as they saw the child's passport. To this day he and his friends of a similar age have to fight hard against their automatic response to fall asleep if they're travelling from Austria to Hungary. We walk on beyond a gold star topped soviet war memorial to a bronze statue of Ronald Reagan, there as thanks to Reagan for helping to bankrupt communism and bring freedom to Hungary. A little onwards we stop at the statue of a small man in a long coat and hat standing on a bridge with his back to the soviet memorial and his face turned to the parliament building. The unassuming looking bronze man is Imre Nagy, who was Hungary's leader during the 1956 revolution that was brutally crushed by soviet Russia. He was a devoted Marxist, but did not believe in the form of communism he saw and proposed reforms such as a multi-party system that the Russian politburo didn't approve of. After the revolution was crushed he was tried and executed in secret. Until the 1989 fall of communism his name wasn't allowed to be spoken in public. Across the road are further reminders of the bloody suppression of 1956. A building opposite the parliament has hundreds of small metal spheres attached to it, each marking the bullet hole of a shot fired at unarmed protestors by army snipers. In the square outside the parliament itself stands a hungarian flag with a circular hole in the centre. To use the flag as their own the 1956 revolutionaries cut out the communist emblem at the middle of it, showing their belief in Hungary, but not oppressive communism. While Adam hasn't been affected by the cold during our two hour tour, I've lost all feeling in my toes and Ste is furiously rubbing his gloved hands together, so we stand in a metro entrance while Adam marks a few bars and cafes on our map. He's in good agreement with Alex and ends up mostly underlining ones already marked. We thank Adam for his great tour and taking the time for just the two of us. We tip him, probably excessively, but feel for what was a personal service that it was easily deserved. Ste and I look for a pre-dinner drink in the highly recommended Di Vino wine bar, which both Adam and Alex claimed wasn't too expensive, especially for western tourists like ourselves. Given my very limited knowledge of wine we decide it is best if Ste goes to the bar to order while I do something I'm more qualified for; like finding a seat, which I manage to do on the long padded bench in the gently lit and elegant looking back of the bar. Ste returns holding two oversized glasses and a good portion of wine in each with news that he'd spent the last of our Florins, which we'd assumed would last for the entire duration of our stay. While I don't have a good appreciation of wine, what I'm drinking tastes excellent and was well worth the money. We chat about various diverse topics while watching the local well-to-do and groups of upper market tourists come and go. Feeling poor, but hungry, we head towards less the expensive bars and restaurants of the jewish quarter. In a long series of courtyards we find a busy looking restaurant that serves Hungarian food. The interior is smartly decorated, the bar is fronted with beer crates and the lighting comes from upturned step-ladders hanging from the ceiling that are studded with lightbulbs. I eat an enjoyably simple meal, minced pork meat wrapped in cabbage leaves, somewhat at odds with the fashionable surroundings. Perhaps this is the Hungarian equivalent of a gourmet burger or fish and chips served in up-market pubs, the sort of place where ketchup comes in a small ramekin. After dinner we head a little further south, looking for the Szimpla bar, which we've been told was selected by Lonely Planet as the best bar on Earth. When we get to the entrance it still looks very quiet, so we go to the smaller and more welcoming looking Fashion Bar opposite. The inside is decorated like a clothes shop with lots of mismatched tables and chairs, in the window stand a few armless dummies. Each bar has a very different variety of lagers on offer, in this case it was Keserű Méz, served in a stein with an cyberpunk girl logo. I don't know if it's because there is a wide variety of beer available in Hungary or if the bars are affiliated with different small breweries, but unlike Belgrade there doesn't seem to be a particular big brand of beer you could reliably find in each bar; and that's not a complaint. After watching more people head through the industrial plastic curtains of Szimpla's entrance, Ste and I head across. 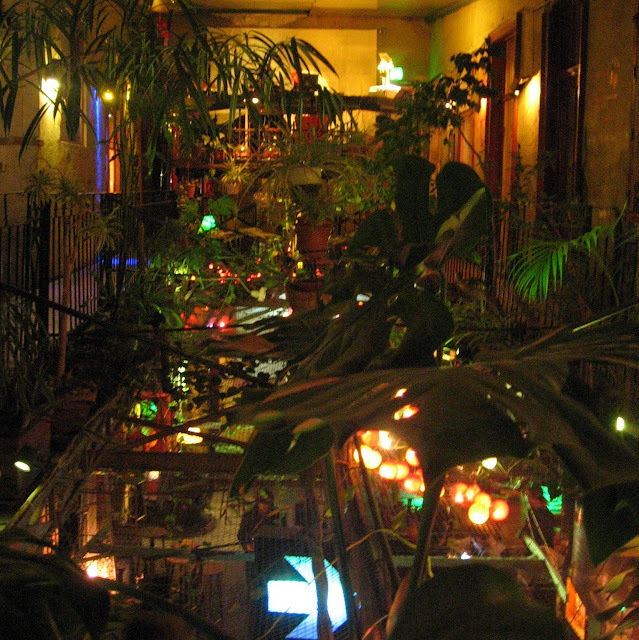 The inside is graffitied bare concrete walls that are colourfully lit with a variety of fairy lights. The centre has an atrium filled with ferns and palms. A DJ is playing generic dance music loudly from his command and control booth on the top floor. For a Monday night it's quite busy, but there isn't a serious hard partying buzz, understandable given it's the start of the week. Most of the other drinkers appear to be tourists like us, but mostly in bigger groups, as well as students. We sit and continue to chat, but the music makes it hard and the popularity of the bar has clearly had an effect on the prices. Feeling old man-ish and cheap, we decide to head out and look for somewhere you can talk more easily. Starting back towards the hostel we quickly find the quieter Szóda Kávézó és Mulató; red lit with giant manga murals on the ceiling. We go in and relax in the surprisingly low and comfortable chairs. Here our amateur philosophising really takes off. With a good atmosphere and decent beer Ste and I get to work setting the World to rights. The details of what were discussed were clearly very important; vital to the world. So important that you can't remember them the next day. Whichever way the discussion ended, it ended late. The only firm conclusion we came to is that Budapest is great and everyone should visit.